Paranormal Romance and More: Giveaway & Interview with Marcus Lopes, author of Freestyle Love! Giveaway & Interview with Marcus Lopes, author of Freestyle Love! Please help me welcome author Marcus Lopes to Reading with Holly! Holly: Hi Marcus! Would you tell us a little bit about yourself? Marcus Lopes: It’s never easy for me to talk about myself, but here goes. I’m passionate about writing. It has been an important part of my life for as long as I can remember. I start my day writing in my journal before moving on to the current work-in-progress. I am also a painter and I dabble in music composition, but my priority is my writing. If I don’t write during the day, I become irritable, like when I don’t have enough coffee. You could say that my writing career began in 2003 when my first essay was published. Since then, my writing — essays, short stories and some poetry — has appeared in several print and online literary journals in Canada, the U.S. and Britain. 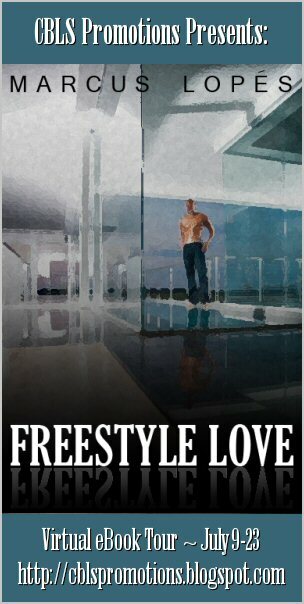 My first novel, Freestyle Love, was published by Lazy Day Publishing in November 2011. Marcus Lopes: I knew that I wanted to write and publish a book when I was in university. Initially, I went to journalism school because I loved writing. But two years into the program, I knew that I wasn’t interested in that type of writing. When I should have been studying for exams or doing research for papers, I was holed up in a coffee shop or an isolated area of the university library writing. But there was a lot of pressure, familial pressure, to get a university degree and a normal, nine to five , job. And I had succumbed to that pressure, and kept my writing more as a hobby than anything else. But writing keep trying to push its way forward, and it was as if I was resisting God’s will. When I finally stopped worrying about what people thought about writing and a life in the arts, and gave myself completely over to my writing, things just naturally happened. Holly: Can you tell us a little bit about your book, Freestyle Love? 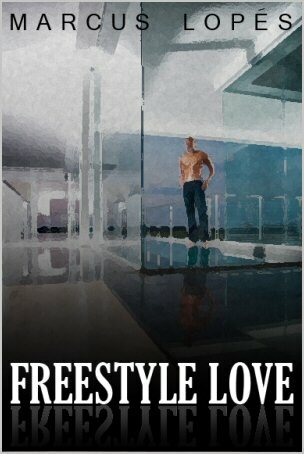 Marcus Lopes: Freestyle Love, in many ways, is not your typical romance novel. Love may be the novel’s currency, but it’s really the characters’ actions and reactions — how they interact in love — that interests me. Sometimes we let our experiences define who we are, and that is the trap that Malachi Bishop involuntary falls into. Malachi is far from perfect — although I think in his mind he’d disagree. He’s arrogant and uncompromising, held to the “It’s my way or the highway” mentality. Malachi becomes a character people love to hate. So Malachi, on an unexpected journey of self-discovery, experiences a sort of great awakening, moving from “denial” to acceptance of the man he thought he was to the man, at the end of the novel, who he becomes. Holly: Where can we purchase Freestyle Love? Marcus Lopes: Freestyle Love is available from Lazy Day Publishing, Amazon, Barnes & Noble, and All Romance. Marcus Lopes: At present, I have several projects on the go. I’m trying to find a publisher for my second novel. I’m currently rewriting a third novel and have just finished the first draft of another novella. I am also polishing off a couple of short stories. As I mentioned earlier, I’m also a painter, so I am working on a new series as well for an upcoming exhibition. Marcus Lopes: I am currently reading Julia Cameron’s Faith and Will: Weathering the Storms in Our Spiritual Lives. It is challenging my belief systems, and forcing me to take a hard look at my faith and relationship to God. Marcus Lopes: I appreciate my readers so much, and I thank them for sticking with me. Some of my readers have followed my writing career since the beginning, and have always been genuine and true in their feedback, which I appreciate. 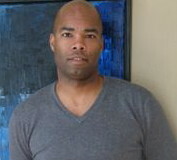 Marcus Lopes: My first publishing experience occurred in 2003. That spring I had submitted an essay to the Canadian literary magazine, Other Voices (there’s an American revue that shares the same name). The essay, while rejected, was returned to me with an encouraging note from the editor and some feedback. I still laugh at the editor’s note because in it he said that if I wasn’t offended by the feedback, and chose to rework the essay, he’d be happy to reconsider it at a later day. I was happy just to receive more than an impersonal rejection letter, and his criticisms were valid. I reworked the text, resubmitted, and then my essay, “On Being Black,” was accepted for publication. Marcus Lopes: In the morning, after my journaling and before I start my writing session. Marcus Lopes: Cats. I have four cats.